SDFormat links, joints, and models each have their own coordinate frames that can be offset using the <pose> tag. See the previous tutorial about specifying poses for more detail on the <pose> tag. The <model> tag serves as a named container for a group of links and joints. Its full specification can be found here. The <link> tag represents a named rigid body and must be the child of a <model>. Its full specification can be found here. The <joint> tag represents a kinematic relationship between rigid body links that constrains the degrees of freedom between those links. It must be a child of a model. Its full specification can be found here. There are several different types of joints that can be specified in the type attribute. The supported joint types are listed below along with the number of degrees of freedom remaining between the two links. As discussed in the previous section, the specification requires all sibling elements of the same type to have unique names. This technically permits a sibling link and joint to have the same name, such as the following example, but this is not recommended as it can lead to confusion and may be disallowed by a future version of the spec. 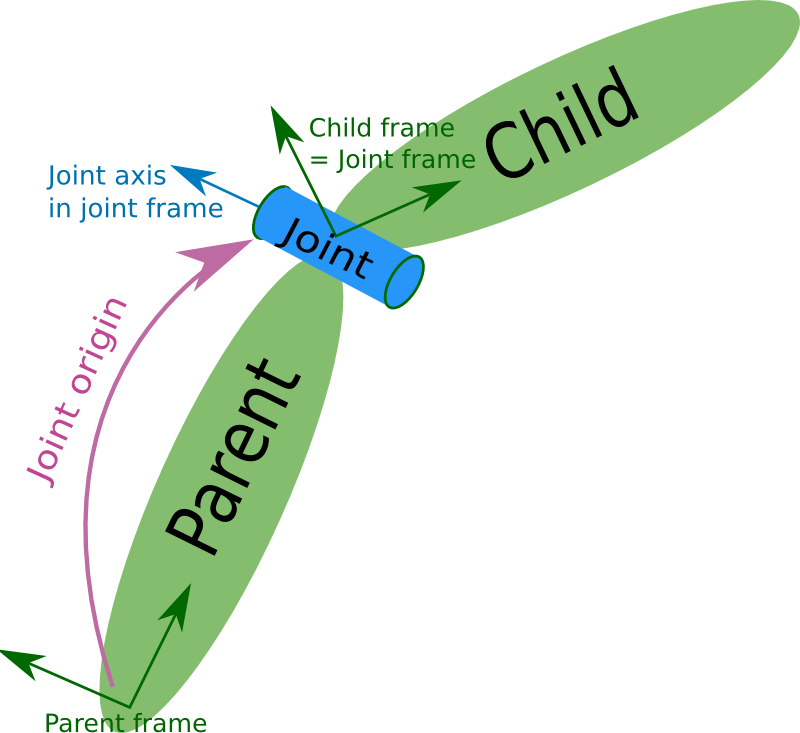 The joint <pose> tag is a coordinate transform applied relative to the child link frame to define the joint frame. While a <pose> tag is not necessary for a fixed joint, it is used regularly in other joint types. See the following example for an illustration of the joint pose. Jp is the frame rigidly affixed to the parent link. Jc is the frame rigidly affixed to the child link. J is the joint frame. The current specification is ambiguous about this frame after motion, and whether it is rigidly affixed to the parent or child frames; however, at the initial configuration, the frames J, Jp, and Jc are all coincident. The rotational axis of a revolute joint is specified by a unit vector in the <xyz> tag under the <axis> element. Because rotation occurs around this axis, it can be seen as specified in either Jp or Jc, and thus is compatible with the current ambiguity of the specification. The joint pose and axis direction for the following SDF model are illustrated in the following figure, with model frame M, parent link frame P, phild link frame C, and joint frame J. In this section, a revolute joint is used to further demonstrate the use of the <pose> tag with concrete examples. In these examples, the joint pose is set so that at the initial configuration, the displacement vectors from the joint to each link are orthogonal to each other. In the first example, the xyz component of the joint pose is set to 0 0 -0.1. Since the pose is specified relative to the child link (linkB), the position of the joint in the world frame is 0.1 0 0. The initial configuration of this model is shown in the following figure. In the second example, the parent and child links have the same pose relative to the model frame, but the xyz component of the joint pose is set to 0 -0.1 0. This changes the position of the joint in the world frame to 0 0 0.1. Note that the pose of linkB and link2 is the same in both models. In both examples, the <axis> tag is used to specify the axis of rotation of the revolute joint. This axis is specified relative to the joint frame. The model configurations for joint values of 0.78 radians (~45 degrees) are shown in the following figure. Note that this results in two very different poses for linkB and link2 even though they had the same initial world pose.